Where do you go when you are looking for the latest fashion designs? Or want to see what is à la mode on the High Street? Or perhaps, just want to see what’s going on in the city? Well, the internet. Right? Or a fashion magazine. At the Theatre, c. 1879. Pastel, 53.3 x 43.2 cm. The Nelson-Atkins Museum of Art , Kansas City, Missouri. I think that if we were to be suddenly transported to the 19th Century we would be in for a big culture shock! No internet, no modern conveniences…and yet, society of the 19th Century, in some respects, is considered to be more cultured and sophisticated than our own. More genteel, certainly! Impressionists such as Renoir, Cassatt, and Monet: these were the people who were responsible for providing society with images of the latest fashion trends. 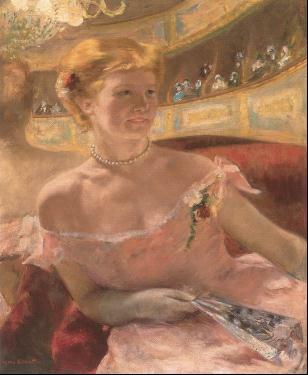 Cassatt, for example, painted theatre-goers. The who’s who of Paris fashion attended these soirees, so it is not far out of the realms of possibility that these paintings would be consulted by the fashionably elite to check out what was being worn, where and by whom…remind you of any of our celeb magazines now? 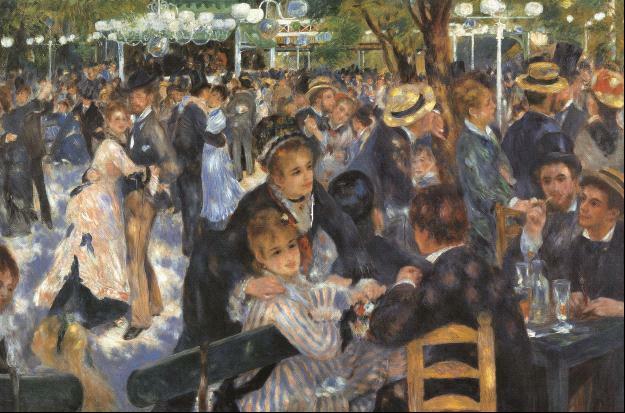 Pierre Auguste Renoir was busy capturing life in the moment – the lively scene in the ‘ball at the moulin de la gallete’ is so busy, you can practically see the movement and hear the buzz of conversation. The impressionists were offering an alternative to the black and white photography of the day. It was not a direct competition, but what they could do that the photographers couldn’t was to offer a subjective, colourful view of day to day life. Final thought before I finish: In their day, the Impressionists were viewed contemptuously by the members of the jury of the Salon. Their work was rejected and ridiculed due to the colours that they employed and the thick brushstrokes that they used. 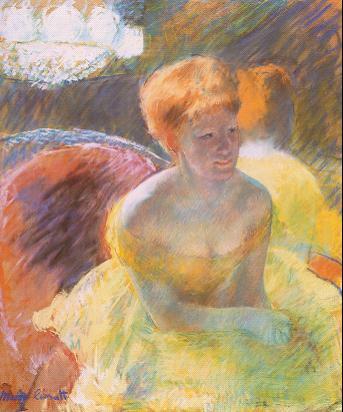 Mary Cassatt was even criticised for painting her subjects too realistically to be flattering. This makes me wonder – we now rely on the Impressionists’ work for a sense of the culture, fashion and way of life in the 19th century. In another couple of centuries, are today’s paparazzi going to be admired as much as we admire the Impressionists? Because, let’s face it, they too offer a glimpse into culture, celebrity fashion and day-to-day activities. They are also not highly regarded by many people in today’s society… so you see, there are links to be made between the two! For a broader look into 19th Century life and fashion, check out the ‘L’impressionisme et la mode’ exhibition at the Musée d’Orsay, being held between the 25th September 2012 and 20th January 2013. Or, if you just want to be enchanted by a simpler time and appreciate the elegance and gentility of the 19th Century from the comfort of your technologically advanced home, take a look at Nathalia Brodskaya’s Impressionism. haha i love the comparison!! Where would we be without the paparazzi? Probably with sketch-artists painting caricatures again! I think people will always like a bit of a gossip and scandal… But the Impressionists got there first! Previous Entry Andy Warhol – Masse oder Klasse?